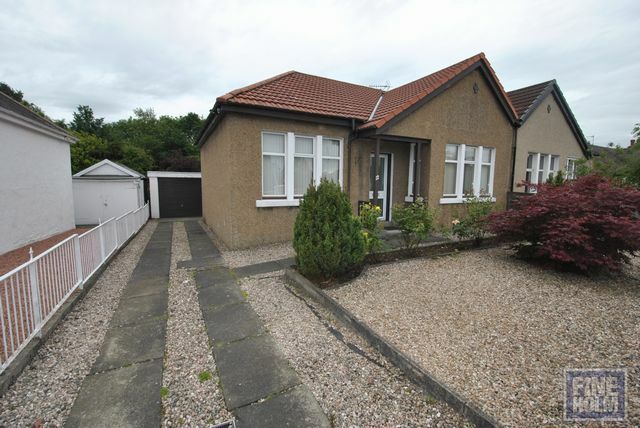 Seldom available, this traditional three bedroom semi- detached bungalow is set in one of Rutherglen's favoured addresses. Offering family accommodation split over two levels, this impressive property is situated in well maintained secure gardens with garage and driveway to the side. The entrance vestibule leads to the reception hallway with access to ground level rooms and stairs leading to an upper level. The ground level comprises a spacious formal lounge with bay window and a generous double bedroom to the front. To the rear is a second double bedroom, an additional sitting room and the kitchen which includes a range of wall and base mounted units plus all appliances and access to the rear garden. A modern family bathroom further compliments the downstairs accommodation. Stairs from the sitting room lead to the upper landing, which opens onto space that could be utilised as a small study, and leads to the third double bedroom. Well maintained front and spacious secure garden to rear with driveway and garage. Ideally located for all local amenities, supermarkets and both primary and secondary schools. Quick access to M74 & M8 Motorways with frequent rail and bus services. I can't thank you and Laura enough for all your hard work in getting me to this part. You have both been an absolute pleasure to deal with from beginning to end and I can't speak highly enough of Fineholm and will certainly be recommending you to anyone and everyone.